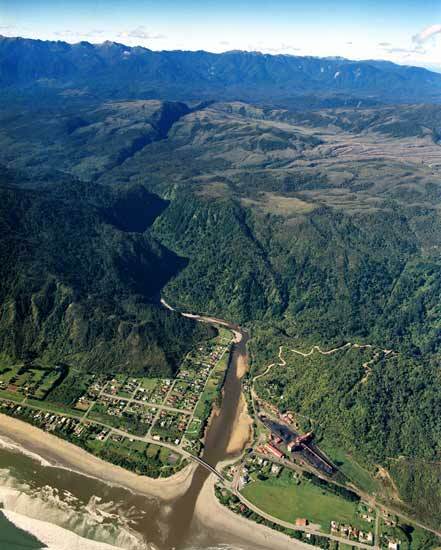 Flowing from its headwaters in the Glasgow Range (skyline) to the Tasman Sea, the Ngākawau River has cut a spectacular gorge across the northern part of the Buller coalfield plateau. Coal is mined on the plateau, and transported to a coal-handling plant, from where it is loaded onto trains to Christchurch. The Charming Creek walkway follows the south (right) bank of the river along an abandoned railway line through the Ngākawau gorge. The township of Hector, on the northern (left) side of the Ngākawau River, is named after James Hector, a geologist who carried out the first detailed survey of the coalfield.